BriteSmile is the best investment you can make in yourself. Our revolutionary	technology is clinically proven to get your teeth their whitest. Over	800,000 happy clients worldwide agree! Sit back and relax for an hour while a dental professional oversees our	safe and gentle tooth-whitening system. 1. BriteSmile teeth whitening gel is carefully applied to your teeth. 2. The gel is then activated by BriteSmile’s patented gentle blue light	for 20 minutes while you relax and watch TV or listen to music. 3. 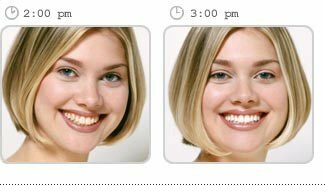 This teeth whitening process is repeated twice more before you go home	with a naturally brilliant new smile (and your personal “Before &	After” photos).